Police in Wincham, New Hampshire, are warning parents that a stalker is allegedly targeting high school athletes on social media. A New Hampshire man is accused of using social media to target high school athletes and trying to get them to send him photos. Windham police say 36-year-old Robert Slye of Danville pretended to be a woman named Nicole Grace Smith on Facebook. 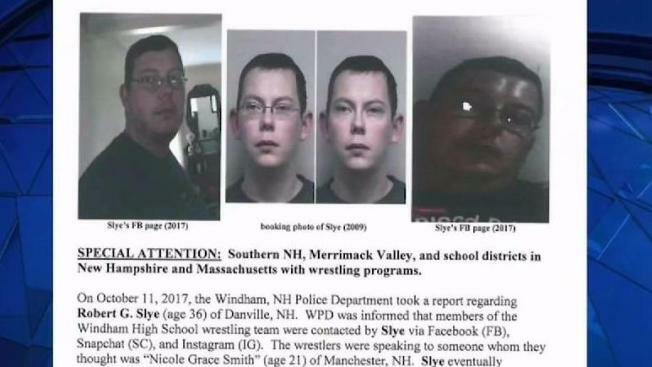 Slye allegedly asked boys on the Windham High School wrestling team to send him photos. Slye, police say, has a criminal history of stalking boys and girls, dating back to 2000, often using social media and focusing on young wrestlers. The Massachusetts Interscholastic Athlete Association is so concerned about Slye's alleged behavior that they sent a safety alert to all 378 of its member schools. Police say the case is an example of why parents need to remind kids about the dangers lurking online. NBC Boston went to Slye's Danville home, where he said he had no comment on the allegations.